Portrait of Anthony Wayne, ca. 1795. General Wayne lead a military campaign against Native American tribes in the Northwest Territory that culminated with the Battle of Fallen Timbers in 1794 and the signing of the Treaty of Greene Ville in 1795. 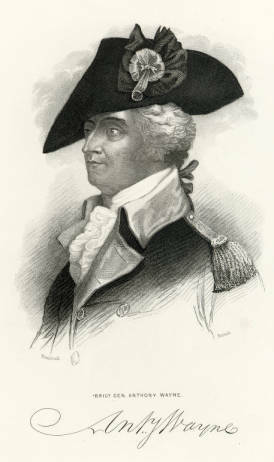 Anthony Wayne was an instrumental American military leader during and after the American Revolution. Born on January 1, 1745, in Waynesboro, Pennsylvania, Anthony Wayne attended his uncle’s private school in Philadelphia where he trained to become a surveyor. In 1765, a Pennsylvania real estate company sent Wayne to Nova Scotia to survey and help to settle 100,000 acres of company owned land. When he returned to Pennsylvania in 1766, Wayne worked for his father's tannery business which he eventually inherited when his father died in 1774. Wayne served on numerous committees in his home county, and encouraged his community to support rebellion against the British government. He served in the Pennsylvania legislature in 1775 and joined the Continental Army in 1776 where he quickly advanced to the rank of brigadier-general in 1777. Due to his lack of military experience before enlisting, other more experienced officers resented Wayne's quick advancement. He became known for his bravado and ill-advised attacks, earning the nickname "Mad" Anthony Wayne because of his impulsive actions on the battlefield. He participated in America's failed invasion of Canada in 1776 and assumed the command of Fort Ticonderoga later that same year. The following year, he assisted George Washington in his failed defense of the nation's capital, Philadelphia. In 1779, Wayne led an American force against British soldiers at Stony Point, New York, where he captured the entire garrison, a crucial victory for the Anglo-American settlers. The Continental Army had experienced few recent successes, and this victory improved the soldiers' morale. In 1780, Wayne played a critical role in preventing Benedict Arnold from turning over the American fortifications at West Point to British forces. By serving as the men's advocate before the Confederation Congress, Wayne also helped to eliminate a mutiny of Pennsylvania soldiers who had not received payment from the government formed by the Articles of Confederation. Following Lord Cornwallis's defeat at Yorktown, Virginia, in October 1781, Wayne served in Georgia against British Loyalists and their American Indian allies, especially the Creek and Cherokee peoples. Having attained the rank of major general, Wayne retired in 1783 from the Continental Army. From 1783-1792, Wayne remained a civilian in Pennsylvania. He held several political offices, including a seat in the Pennsylvania legislature in 1784 and 1785. He was a strong supporter of the Constitution and served as one of Georgia's members of the United States House of Representatives from 1791 to 1792, but was removed from this position in 1792 because he had failed to take up residency in Georgia, even though Georgia had given Wayne an eight-hundred-acre rice plantation for his assistance against the area’s American Indian nations. In 1792, President George Washington appointed Wayne as the commander of the United States Army of the Northwest, and appointed him to serve in the Northwest Territory, where he created a militia called The Legion which underwent merciless training and drills. The major objective of The Legion was to protect Anglo-American settlers from American Indian attacks and to forcibly push native peoples out of Ohio Country to pave the way for expansion. Josiah Harmar and Arthur St. Clair had both been defeated at the hands of Ohio's American Indians in previous years, and Washington hoped that Wayne would prove to be more successful. To help defend the frontier, Wayne ordered the construction of several forts, including Fort Recovery, Fort Defiance, and Fort Greene Ville. The construction of these forts and the degree of Anglo-American activity in Ohio made American Indian leaders suspicious and nervous, and an American Indian Confederacy actively fought against settlers’ expansion onto their land. To ease their fears, the American Indians' British allies constructed Fort Miami on the Maumee River. During 1794, Wayne moved against the American Indians and on August 20, 1794, the two forces met at the Battle of Fallen Timbers. Wayne's men drove the American Indian forces from the battlefield. Thirty-three Anglo-American soldiers were killed and roughly one hundred wounded, while the American Indians lost approximately twice that number. Blue Jacket, leader of the Shawnee Nation, and his men retreated to Fort Miami, hoping the British would provide protection and assistance against Wayne's army; the British refused and Wayne followed the American Indians to the fort. Upon his arrival, Wayne ordered the British to evacuate the Northwest Territory, but the British commander refused and Wayne decided to withdraw to Fort Greene Ville. For the next year, Wayne stayed at Fort Greene Ville, negotiating a treaty with Ohio's American Indians. After their disastrous defeat at Fallen Timbers, American Indians realized that they were at a serious disadvantage with the settlers because of Britain's refusal to support them and the settlers steadily encroaching on their land. On August 3, 1795, the Treaty of Greenville was signed. Representatives from the Miamis, Wyandotte, Shawnee, Delaware, and other American Indian nations agreed to move to the northwestern part of what is present-day Ohio. In doing so, they left behind their lands south and east of the agreed upon boundary. Not all American Indians, however, concurred with the treaty, and bloodshed continued in the region for the next twenty years as Anglo-American settlers and American Indians struggled for control of the region. Boyd, Thomas. Mad Anthony Wayne. New York: C. Scribner's Sons, 1929. Millet, Allan R.'Caesar and the Conquest of the Northwest Territory: The Wayne Campaign, 1792–95.' "Timeline," May-June 1997, p.2-21. Preston, John Hyde. A Gentleman Rebel: Mad Anthony Wayne. Garden City, NY: Garden City Publishing Co., Inc., 1930. Tucker, Glenn. Mad Anthony Wayne and the New Nation: The Story of Washington's Front-line General. Harrisburg, PA: Stackpole Books, 1973.